On Christmas Day, 2013, Breckenridge unleashed Peak 6 to North America’s insatiable alpine crowd. With an unveiling of a total of 220 brand-new hectares, larger than many Eastern resorts, this was one of the greatest new ski area terrain offerings in the past decade. When I thought about doing a bowl in the high alpine I jumped on the first plane south. 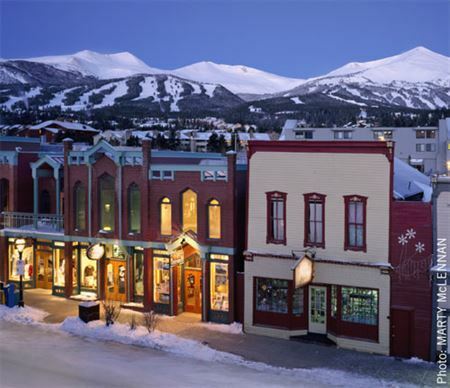 Breckenridge’s edginess takes shape as we shift through its village centre. Historic clapboarded storefronts with snow-laden gables and off-kilter porticos come into focus. Now transformed into colourful eateries and boutiques, the rusty nails poking out of the walls reveal enough mining-town grit that the local distillery, brewery and half-dozen cannabis dispensaries feel right at home here. In order to optimize my “Peak” experience, I’m meeting with one of the nine-person-strong, elite Breck Guides program. Steve Edberg, the barrel-chested father of two with salt-and-pepper goatee, introduces himself as Shredberg. We squeeze through the just opened lift corrals with bulging backpacks and onto the frosty, high-speed Colorado Superchair (which was replaced by a high-speed six-pack this past summer). The cats whirr through their final corduroy passes below. Shredberg details the brand-new Guides program. It matches expert skiers with guides who come equipped with the skill set (the majority are high-level, ski school examiners), locals’ know-how (Shredberg is a PSIA examiner who has worked this mountain for 17 years, with plenty of avy and first-aid experience to boot) and technology (avalanche rescue gear and a walkie-talkie tuned into the Ski Patrol). While clients can choose from a menu of options ranging from learning search/rescue and probing techniques to discovering the best snow on the mountain, I invariably go for the latter. There’s no question of chicken-or-egg primacy. Peak 6, with its pride of alpine terrain, has necessitated not only this new guiding program, but also an additional 14 new patrollers and three new avy techs, whom we’re about to meet, to mitigate the added risk. A piercing wind chills us as we glide off the lift. Shredberg explains that the biting weather patterns bring the one-two, snow-cold punch that keeps central Colorado in the deep freeze while the rest of Colorado sports T-shirts. It’s also the reason that Breckenridge’s five peaks offer ideal, above-treeline skiing and one of the longest seasons in the continental U.S.
We de-ski by the toboggans and enter via the Vista House’s back door where the weather-beaten patrollers, still reeling from the weekend-long, record-breaking 99-cm snowfall, gather. Despite a snowless night, the breeze has refilled the snow cover and rebuilt cornices hanging over virtually every peak. The boss is doling out yet another dozen bombs to his well-practiced charges. While they organize the explosives, Shredberg and I take our warm-up runs with first tracks on snow country’s highest high-speed quad, the 3,914m Imperial Express Superchair. At 3,963m, the view atop Peak 8 reveals a formidable impasse. The entire east-facing Ten Mile range stretches from Frisco in the north to the ski area’s southern boundary. Massive as it is, the streak of summits still remains untouched by modern transportation other than the ski lifts we ride (the Grand Army of the Republic Hwy, aka I-70, skirts it to the north). 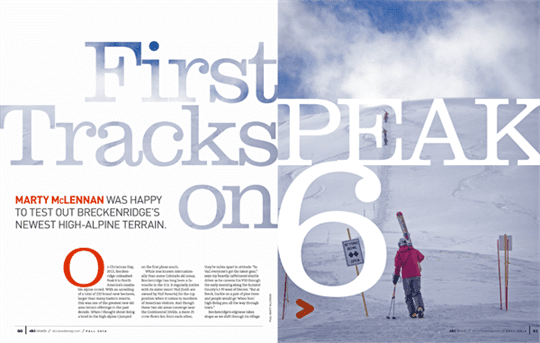 With the distance between summits spanning roughly a mile, it’s easy to calculate Breckenridge’s impressive five-peak girth (from Peak 10 to Peak 6), but a massive undertaking to tame. While counting the explosions as they echo throughout the valley, we yo-yo northward to Peak 7 where we tear up runs like Vertigo and the open bowl Bill’s Thrill. We’re cruising through snow-laden evergreens, down the scenic and intermediate Monte Cristo, when the 12th blast goes off. Seconds later a call comes in over the radio. “It’s time to awaken your Sixth Sense,” Shredberg says as we veer toward the base of the brand-new Kensho Chair. Breckenridge has long been the land of superlatives. This is the frontier town where Tom Graves uncovered Colorado’s largest chunk of gold, a six-kg nugget worth more than $250,000 today. But mining fortunes collapsed and it wasn’t until 1961 when the newest vein was tapped: winter sport. The population has grown twelvefold since the dreary ’60s when the Porter and Rounds Lumber Company received its first permit for ski area development. Riding the new fixed-grip Zendo quad, Peak 6 glistens above like the promised land. We speed upwards through stands of towering 100- to 150-year-old lodgepole pines and past shiny steel towers over Cucumber Creek. Below, the low-angle runs tell the story of Breckenridge’s easy-to-follow topography: beginner runs down low and intermediate well centred. For advanced riders, Breck’s ridge is where it’s at: black diamonds and bowl skiing all lie treeline and above. And with its bounty of high-alpine terrain, skiing glory is yours, just BYO-red blood cells. We make a sharp right turn exiting the lift and glide toward the Kensho six-pack where, for the second half of the ride, the much lauded Serenity Bowl at Peak 6 opens up before our eyes. The cartographer’s evenly spaced contours don’t lie. We’re speeding upwards through the dead centre of a bald peak with limitless access, fall lines cascading downwards. With the piste literally ours, we link effortless, under-the-lift turns. The appropriately named Reverie and Bliss offer near-perfect, intermediate-graded fall lines through ankle-deep Colorado pow, even though they were heavily skied over the weekend. After a couple of runs, the multitude catches up. So we take the short climb for a spectacular traverse northwards for Beyond Bowl’s coveted black diamonds. Despite what my driver said this morning, by now it’s clear that most Breckenridge skiers don’t ski pine trees. It’s mostly a local crowd led by a lifestyle-first, dressed-down and heavily bearded bunch. These guys have all the gear to ski like the wind and they’re hungry for more. Trying to stay one step ahead, Shredberg suggests we top off the morning with a significant bootpack climb to the extreme terrain in the storied (and steeeeep) Sixth Sense chutes, but rather thoughtfully (I’m from Vancouver, elevation zero, after all) has us first stop off at the new 3,750m-high Ski Patrol Hut. It’s in the warm outpost overlooking the wealth of alpine terrain where we chat with mild-mannered Kevin, a long-time patroller from Virginia. He’s gobbling down spent energy from opening this area with a mid-morning snack of a dozen greasy sausages, but still effervescent when talking skiing. With the thought of a prolonged bootpack ahead, I wonder aloud at the accessibility of the virtually untouched Peak 5 just beyond the fence through the window. It is, after all, designated Public Lands. Kevin turns serious. There’s a single access point and ducking the ropes is punishable by law. Breckenridge has worked hard to negotiate this extra terrain, but the Forest Service has made it clear: not an inch more. Historically, and especially in the western U.S., fences, like frontiers, have always been a slippery slope—they protect and restrict in equal measures. My heart pounds as we hike upwards. I know I’m not the only one thinking this, but above the din of my overworked lungs, I can’t help but wonder when Breckenridge’s next biggest terrain opening will be. I’ll be first in line.